These Hallowell all-welded extreme performance lockers are constructed with a 16 gauge unibody, back panel is 18 gauge, doors are 14 gauge louvered and include full height welded in stiffeners for added strength and durability. The hinges are a continuous piano style. Handle is a 3-Point high security turn handle. 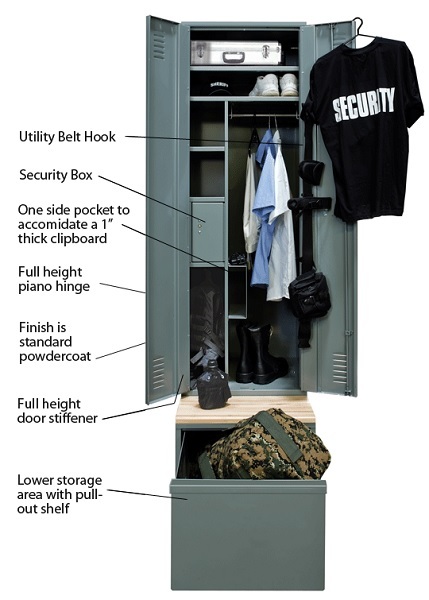 Each locker has two single wall hooks in wardrobe area, single hook in opening below security box, single hook on door, one coat rod, two full-width top shelves, one partial shelf above secirity box. A built in key lock is included for the main and security box. Large lockable storage drawer base with laminates maple wood seat is optional. Base darwer is auto locking when upper doors are closed and latched. Available in #725 Hallowell Gray only.